Lea Salonga wants new Darna to be morena or kayumanggi so they can "represent the darker skinned Pinays." Filipino celebrities have expressed their opinions about the decision of Liza Soberano to back out from portraying Darna on the big screen. "So, what would I love to see as Darna? Someone morena or kayumanggi to represent the darker skinned Pinays to let them know they are powerful and beautiful exactly as they are. I’d also love for her to be a relative unknown. Let the story sell the film. That is all." 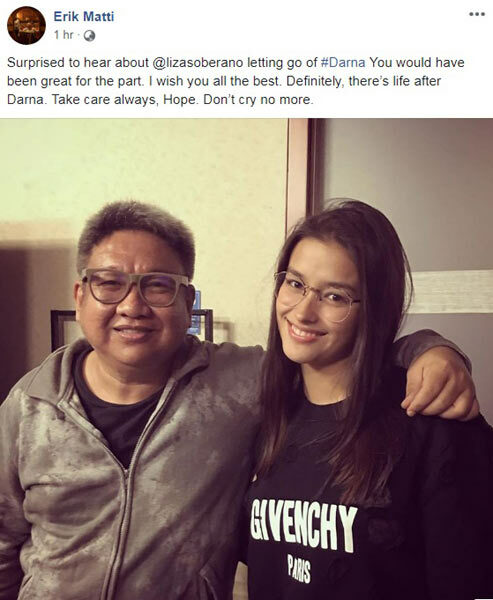 Former Darna director Erik Matti comforted Liza by saying that she should not cry over this missed opportunity. "Surprised to hear about @lizasoberano letting go of #Darna You would have been great for the part. I wish you all the best. Definitely, there’s life after Darna. Take care always, Hope. Don’t cry no more." Direk Erik first worked on the Darna movie in 2014 but in October 2018, he left the project because of "creative differences" with ABS-CBN and Star Cinema. That same month, it was announced that Jerrold Tarog is the new director of Darna. Sino ang dapat ipalit kay Liza Soberano bilang Darna? Was Darna delayed because of Liza's minor surgery?